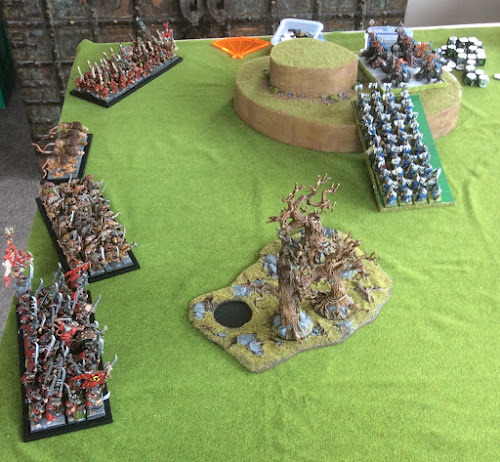 So my first game on Saturday was a rematch with the Dwarfs. I made a few small changes to the list I used in the first game. So I've added some speed to the army at the cost of my Artillery piece and a Regiment of Shock Troops. 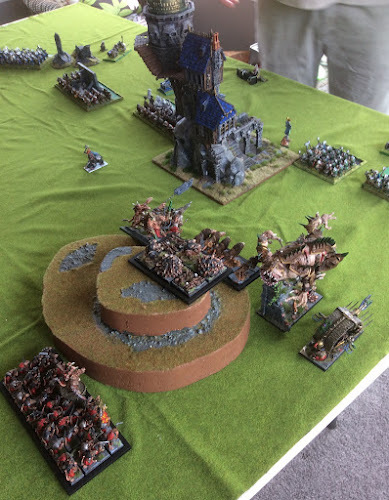 Rob's list was a gunline with two Hordes of guns, three artillery pieces, some brocks and hordes of Warriors and Regiment of De 6 warriors. I decided to play a refused flank game and piled all my heavy hitters on the right. 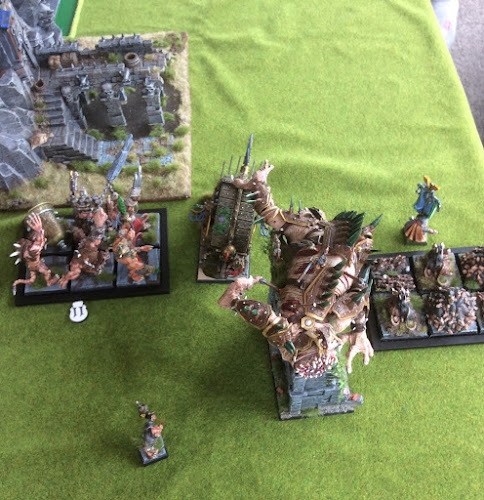 The Brutes, Fiend and Engine were backed up with Hackpaws, Vermintide and Spears. In the centre I left the Legion and the Shock Troops while rest of army on the left. 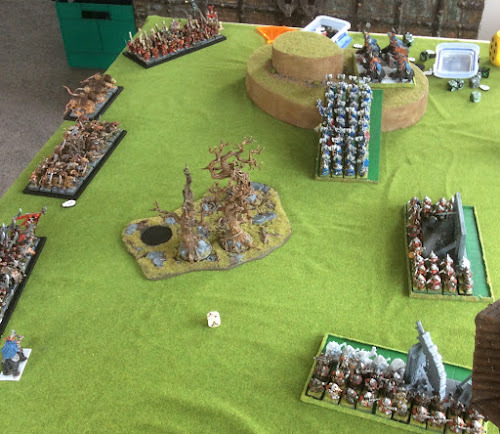 You can see Rob had one Horde and the De 6 guys opposite my stacked flank with one cannon. 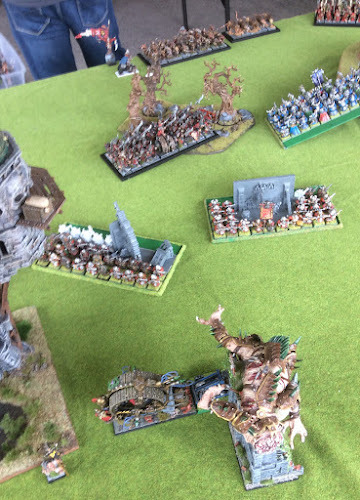 As the game started I moved my centre back but at some point I had a brainfart and moved the Legion up where it was decimated by the Dwarf shooting. Looking along my line on the left. The Blight are out of shot, then Hackpaws, Slaves and Shock Troops. I went through the Dwarf left losing the Hackpaws and receiving 11 wounds on my Brutes (who then hid). 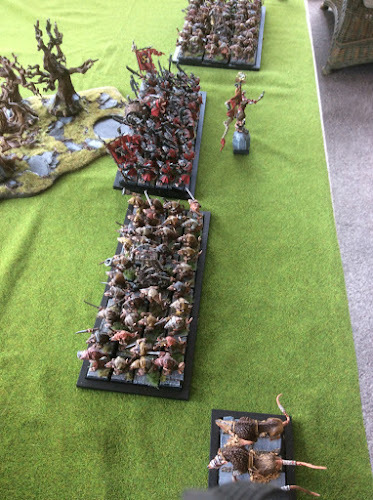 The rest turned to move across the Dwarf lines. One the left a standoff developed. The Blight with Ensnare are good at anchoring the line. You can see the Ratkin monsters now behind the Dwarf lines - not great for the Dwarfs. 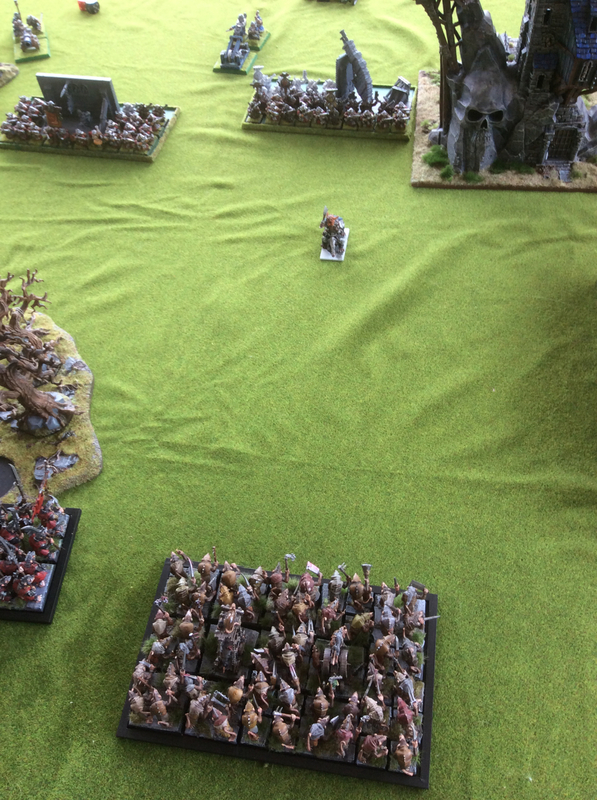 The Dwarf gun hordes have come forward to close with my lines and to escape the monsters. I then used my Caterpillar Shock Troops to threaten the Dwarf guns. 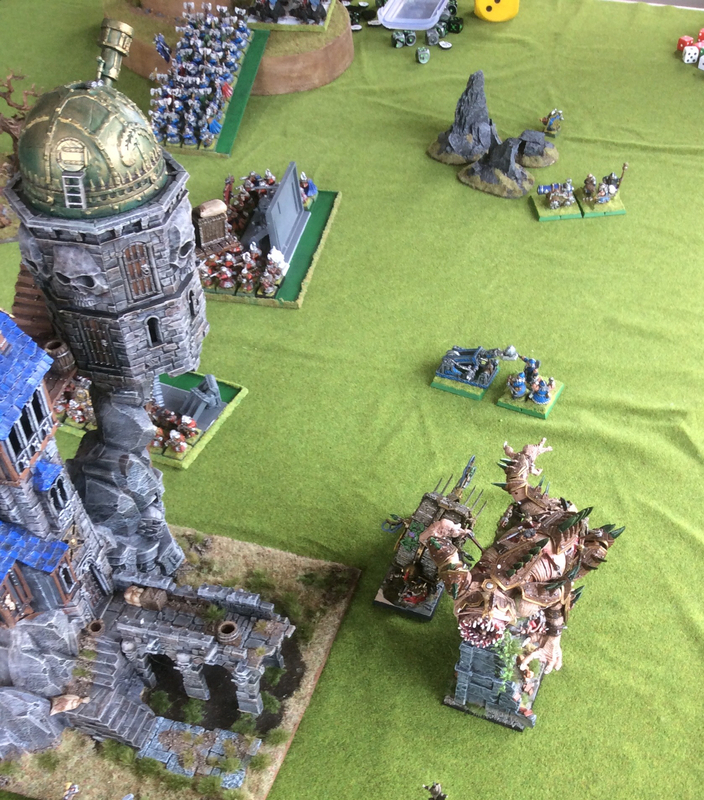 The Monsters clean out Artillery and line up to hit the Dwarf guns. And here we are at the end of Turn 6. I was hoping for a Turn 7 but it wasn't to be. In the end I had killed 610 points to the 290 I lost. So revenge for the Ratkin! Great day thanks for hosting. Sounds like the rats held out well.